One of the easiest ways to add interest to your cookies is to combine cookie cutters together. Stock cutters can become a little boring and you may not be able to find the exact shape you are looking for. With a little creativity you can create just about any shape you could need from cutters you already have. Plus it's super easy too! 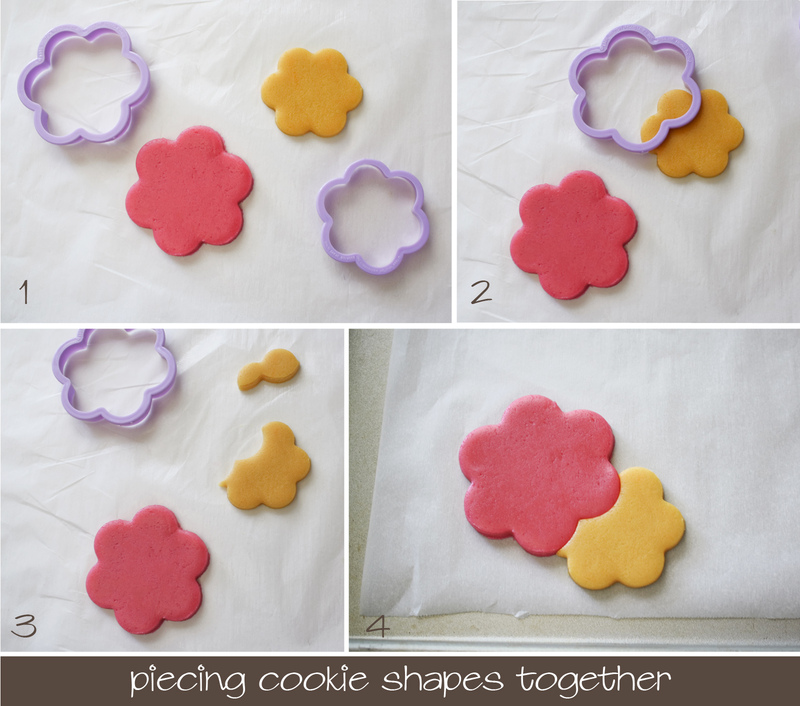 I made these pretty flower cookies by first coloring the dough and then piecing simple flower and leaf shapes together. 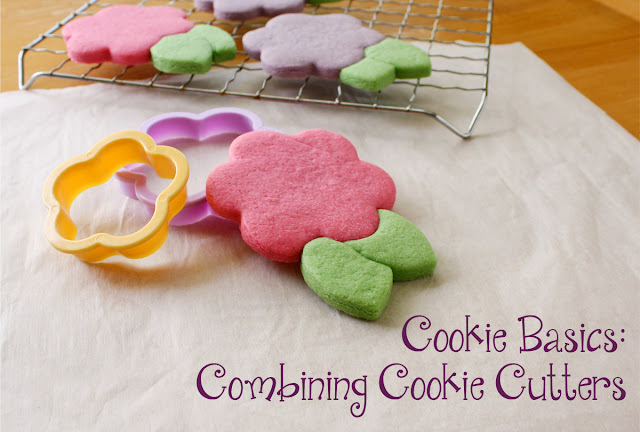 The simplest way to make a new cookie shape is by combining two cookie cutters. Start by cutting both cookie shapes from your cookie dough. Use one of the cutters to trim away a piece of the other shape. Attach the two shapes together on the cookie sheet for baking. When the cookies are baked and cooled the seam will be strong enough to hold the shapes together without breaking. Cut and piece two leaves together on the cookie sheet. 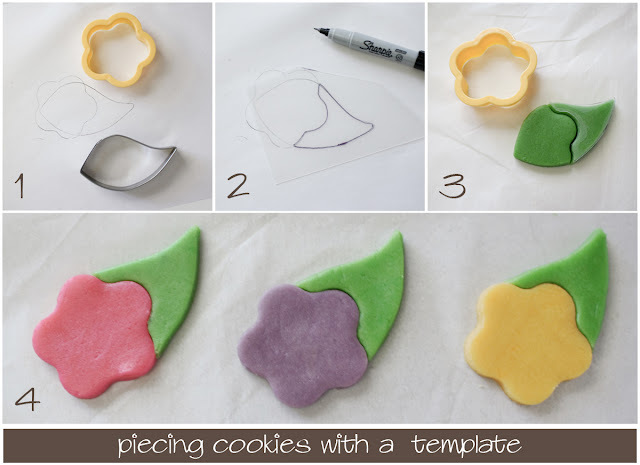 Use the flower cookie cutter to cut the flower shape away from the pieced leaves. Cut the flower shape and piece it together with the leaves for baking. Draw around both cutters on a sheet of paper overlapping them like you will when cutting the cookies. Trace a part of the drawing onto a piece of transparent template plastic and cut it out with scissors. After cutting the first cookie shape lay the template on the cookie dough and use it as a guide for the second cookie cutter. When you use the template as a guide all the cookies will be the same. I have only had pieced cookies break one time and that was when I had joined them at a very narrow spot. Try to avoid narrow areas and you shouldn't have to worry about breakage. Try to move the cookies as little as possible when they are warm. If you have extra cookie sheets you can let the the cookie cool and decorate them all on one sheet but if you do need to move them just be careful. Always lift the cookies with a cookie spatula securely under the seam. Sarah, What a great tutorial! I really enjoy your beautiful cookie designs. Thanks for sharing this great tip. Que tutorial tan magnifico,muchas gracias.